Now here's an interesting item! Menace from the Moon. London: Jarrolds, 1925. 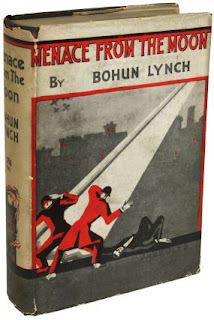 Bohun Lynch (1884-1928) was known for other work, including his expertise as a caricaturist. This is his sole science fiction novel, which involves encountering the universal character of John Wilkins (1614-1672) on the Moon. Wilkins himself speculated on how one could travel to the Moon. This is documented in my earlier blog posts on Wilkins. Wilkins appears as a character in Neal Stephenson's historical fantasia about the Enlightenment, The Baroque Cycle (2003-2004), where he is described as the author of a text called Quicksilver, which presumably represents a transubstantiation of Mercury (see above), a text named in the sequence. There is some poetic justice here, given that the moon is the theme. This novel, unfortunately, is rarer than Lynch's other books. The Library of Congress, the world's largest library, has other books by this author but not this one. If I wanted to purchase a copy today, it would cost me US $120.